In two earlier articles I already described a lot of utilities from CtxAdmTools. In this third article I will described the latest set of tools delivered by Guillermo Musemeci. There are several utilities available for managing published applications via an easier way. 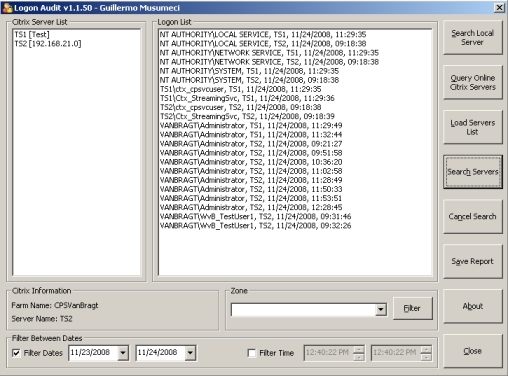 Also Guillermo has a comparable tool available with the logical name Publish Multiple Apps. First the servers and applications should be loaded (can be done with text files or queering the datastore). Next the server and applications should be selected and then the selected applications will be published or removed from the servers. The tool does not show which application is published on which server or which applications are hosted at which server. In comparison with other tools this tool is a bit more basic and some tools offer some more functionality to manage Published Applications. Nevertheless it can be useful tool if you have to publish applications often. In most hybrid profile solutions you need to determine where the application is storing his settings. To easily determine this in the registry a compare between a "before" and "after" situation is the easiest methodology. This can be done with the registry compare utility. You need to create to export the registry settings of the two situations and then load those in the utility and start the compare of the two registries, which will show the differences. Personally I like regshot more, because you do not have to export the files, so it is much easier to make the compare. This small utility is displaying the uptime of the servers available in the Citrix farm. Utility can be easy to quickly check if the reboot schedule is functioning or when auditing a system during a quick scan to determine quickly how long the servers are running. With this utility the Published Applications in the farm are displayed. This is not that spectacular because this can be seen in the Citrix Access Management Console also. But the nice part of this utility is that the view can be changed to a server view and so easily can be seen which server is hosting which applications. I would like to see the utility extended also with the option to show which application is running on which servers. Also the export functions are useful to further analyze the information. This utility searches in the event viewer for messages about profiles which are not loaded or unloaded correctly. Those profiles will be marked as corrupt. You need to have the MSCOMCT2.OCX available to use the utility. Personally I just would use a start-up script that deleted all profiles stored locally on the Terminal Server, because the utility does not offer an option to delete the profiles. Also Logon Audit is based on reading the event logs. This tool searches for events about user logons and will display those events in the Logon Audit GUI. It is sorted on username, followed by the Terminal Server and logon time/date. Although this is not a direct Terminal Server it is a tool which can be really useful in Terminal Server farms. Within this utility a query can be started to search for a specific event ID. Unfortunate you need to specify an event log file where the events IDs are specified. But further I really like the tool, because it was one of the methodologies searching if a problem also exists on other servers. In this article series I described the utilities provided by Guillermo Musemeci. There are several useful utilities, which has functionalities I never found in other freeware utilities. There are also utilities in which functionalities are available, which can be found in other tools. It depends which options you need and which utility you like most.